So, in February of this last year, I had the chance to visit Johannesburg, South Africa. My best friend (who I met in elementary school in MN, but is now expat-ing her way around the world teaching at international schools) was getting married to a lovely Afrikaans fellow whose family lives in Joburg. It was a whirlwind two weeks of sightseeing and wedding events and late night chats about history and politics over braii, but let's be honest, mostly Cape wyn (barbecue and wine in Afrikaans). The wedding itself was at a lovely game lodge in Free State (a few hours south of Joburg), with beautiful views and hordes of vicious mosquitoes descending from the thatched lodge roofs at night. Mosquitoes or no, when I sank into my seat on that plane going home, I felt pretty conflicted. Despite moments of difficulty one always has in new places, I felt like I had found a place I could *maybe* actually live and thrive. The weather was just right, the people friendly, the environment just enough like home in terms of available food and daily comforts to give a modicum of sanity. And yet, there was so much that was radically different and, well, as my best friend puts it, "South African society is like crack for social scientists." So, in April, I started on an eight month mind-eff of a process of applying to grad school and navigating South African bureaucracy to get back to Johannesburg. At the same time, I've been working through a lot of my personal baggage about my South Asia and Hindi-Urdu studies, which I had to let fell by the wayside for a number of reasons. One, I knew that Delhi as an environment for study (something my academic friends pushed me to consider) was just out of the question given certain quirks of health that I have. My jaw disorder alone doesn't do well with intense crowds and noise, and I have to eat a very limited diet in order to make sure other long-term problems don't flare up. Practically, my heart tried to pull me in that direction for several years, but my head told me it would be foolish to expect myself to be able to handle that environment for more than a few weeks at a time. I also realized that the academic field of South Asian studies was frighteningly small--a bad outlook for building a potential career. Beyond even that, I was trying to process my experience with my Hindi-Urdu studies, which looked great on my transcript, but was in practice rather traumatic because of the maddening dysfunctionality of my university department. After the trials of my last two semesters, the language itself became somewhat tainted for me (which makes me more upset than anything specific I actually experienced there). have had a lot of time to spend with my family and friends who are still in Minnesota. I took some professional development classes for geography teachers with the local association MAGE, which gave me more pedagogical and technological tools to engage students in my last semester of teaching AP and world geography. MAGE also asked me to present at their fall workshop/conference, where I got a chance to share some of my super-nerdy strategies for using world cinema to teach social studies. I read a lot of world and classic fiction books and saw probably 50 films of different stripes, which y'all will probably get some posts about soon (whether you want them or not!). I dug into some new language study: Mandarin (semi-formally) and Afrikaans (informally). My new stepmom (very new--as of two weeks ago) is from Beijing (also one of my favorite places I've ever traveled), and I'm having fun trying to interact (badly, albeit) with her in her home language. And obviously, Afrikaans is spoken by a significant minority in SA, and more importantly, by most of my friends there. I was hoping that by engaging with a world entirely other than South Asia (though I've read some fiction and kept Hindi and Bengali films in my heart), I would eventually get back to a place where hearing Hindi didn't trigger anxiety attacks and feelings of personal betrayal. (Obviously, a discarded plan can bring both personal loss and a guilt over one's own faithlessness, however irrational those feelings may actually be.) Thankfully, over the last two months, I've seen that strategy begin to work. Though I've certainly had every advantage in terms of being an international applicant, it's been a mind-eff of a year. Half the time I thought it wouldn't work out at all. Even at the moment I finally finished my applications, most of the universities in SA were shut down over the student "Fees must fall" movement. But, long freaking story short, the universities reopened, I got a couple of acceptance letters, and last week I finally was granted a study visa. So, now, as long as things continue to go smoothly with arrangements for housing, finances, registration, etc., I will be at the University of the Witwatersrand (affectionately known as WITS) in Johannesburg by February, 2017. I'll be studying "migration and displacement" at the African Centre for Migration and Society. Maybe if I like it (and they like me) I might even stay on another year or so to continue studies in public health or health sociology. I'm excited and scared and delighted for this new plan. Maybe I'll love it, maybe I'll hate it, but either way, I'm sure it's going to be a real adventure. I hope you'll stay tuned. P.S. I am in the middle of this fabulous Bengali film, so look for a post on that soon. 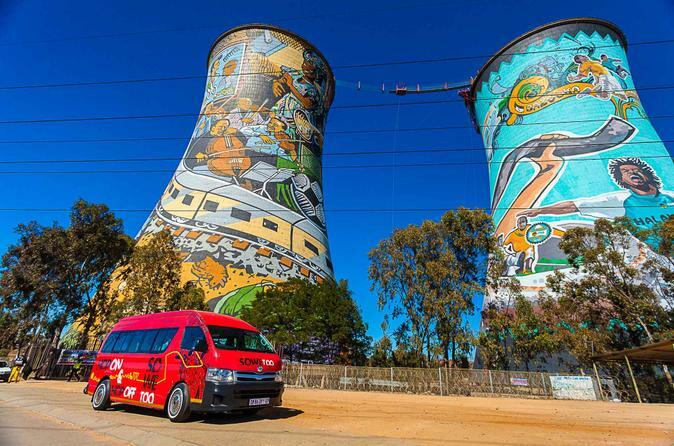 *The first photo isn't mine, but those towers are a pretty famous site when you're driving away from Joburg to Free State. 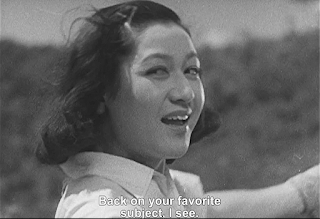 The second screen-shot is from No Regrets for our Youth (Japan, 1946), an anti-fascist Akira Kurosawa film that I strangely got the urge to watch after our *ahem* American election. 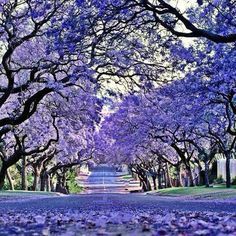 The fourth is of jacaranda trees in Joburg (via pinterest). Miranda, best wishes for success in your new adventures! I look forward to hearing about your experiences and discoveries, both scholarly and otherwise. And you drop some intriguing hints in your post. Fabulous Bengali film? Please do tell. And I'm very curious to hear your thoughts on Black Narcissus (book and film). Your return to posting is most welcome! Thanks, P.! 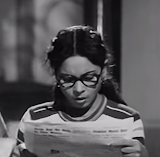 I see you've got a lot of new discoveries on your own blog...including a Bengali film heading the bill. I will be posting about my new Bengali film discovery soon (teaser: it's a remake of a beloved Hollywood caper). 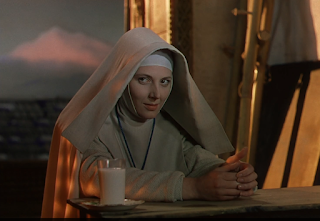 Yes, I've been in a Rumer Godden AND Powell and Pressburger phase this year, so Black Narcissus was kind of a must-see.